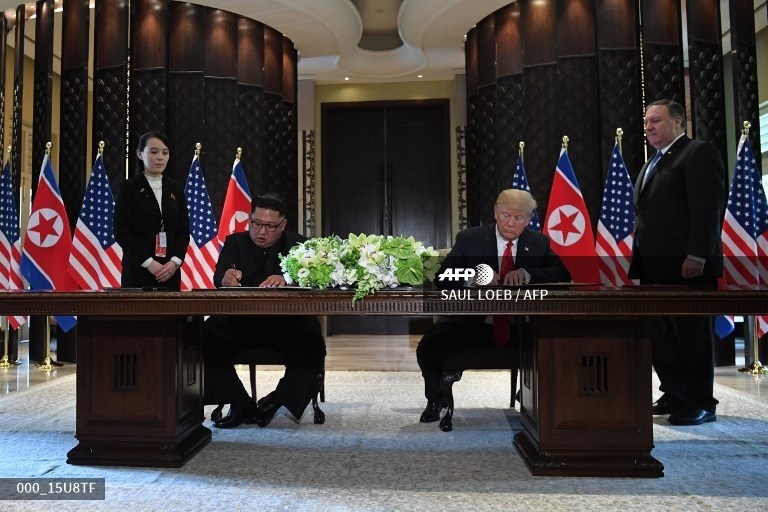 Donald Trump and Kim Jong Un signed a ‘comprehensive’ joint document at the end of their historic summit in Singapore on Tuesday. “We are signing a very important document, a pretty comprehensive document, and we have had a really great term together, a great relationship,” said the US President before the two inked the unspecified document. Trump announced he would be giving a press conference in the coming hours. “We are both very honored to sign the document,” he said. Minutes before, the two leaders had emerged from talks with the US president hailing what he said was “a lot of progress” and a “really fantastic” meeting. The meeting went “better than anybody could have expected,” Trump said as he strolled out of the Capella Hotel side by side with the North Korean leader, adding that the two of them were going on to sign an unspecified document. The two men met one-on-one for around 48 minutes Tuesday accompanied only by their interpreters. They then went into a second meeting where they were joined by key aides. North Korea’s state media lauded Singapore Tuesday as they highlighted Kim Jong Un’s visit to some of its top tourist attractions. He was accompanied by the city-state’s foreign and education ministers — with whom he posed for selfies — and surrounded by officials as police held back pursuing reporters. But images of the young leader are carefully controlled and managed in the isolated North, and travelling media from Pyongyang enjoyed close access to their leader. The fulsome praise for another country is unusual for the media in the impoverished North, which generally do not show detailed images of affluent foreign countries. The bright lights of the Singaporean city scape are a notable contrast to Pyongyang, much of which remains dimly lit at night despite Kim overseeing a number of prestige development projects during his rule. During their stroll, President Donald Trump gave Kim a rare peek inside the US presidential limousine. They walked up to the limousine, nicknamed The Beast, and Trump could be seen talking and gesturing before a Secret Service agent opened the door and the leaders looked in. It wasn’t immediately clear how Kim felt about the presidential tour, but he seemed to be smiling. This entry was posted on June 12, 2018 at 9:36 AM and is filed under Uncategorized. You can subscribe via RSS 2.0 feed to this post's comments. You can skip to the end and leave a response. Pinging is currently not allowed.